A Central Kalahari Safari Experience allows you to see rare Black-Maned Lions that have adapted to a harsh existence in the Central Kalahari. The predominant predators in the Kalahari regions are the Lion, Leopard, Cheetah and Hyena. 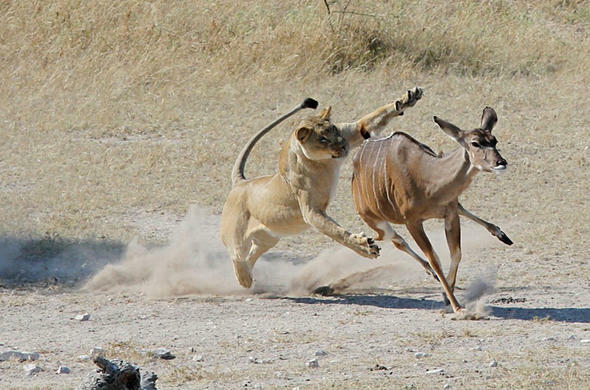 In relation to the occurrence of their prey, Lions are encountered in relatively scattered groups or as sole hunters. 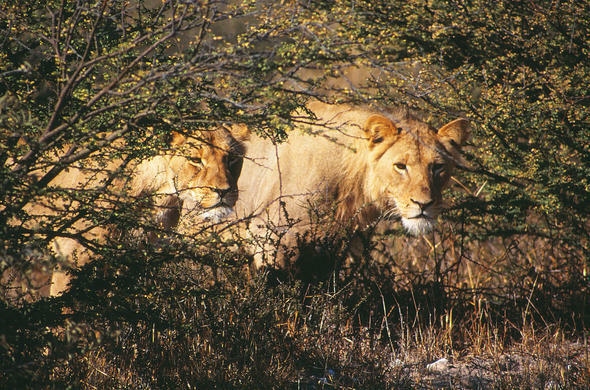 Lions have always displayed the ability to withstand different climates and can be found on a number of reserves within the Kalahari, where temperatures can vary from -15 C to over 40 C. Due to the intense heat and wide dispersal of prey, the Lions are forced to adapt to this harsh reality. 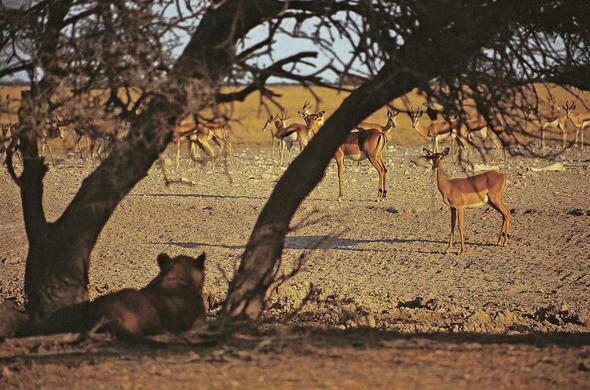 In conditions better suited for survival, large prides of over 30 might prevail; however in the Kalahari that number dwindles to groups ranging from a male and female pair, to 6 lions because of this shortfall of prey. In addition, they often need to travel much longer distances in search of their prey, which often leads to high rates of cub mortality, as Lionesses are away for long periods of time hunting prey in order to produce milk for their young. 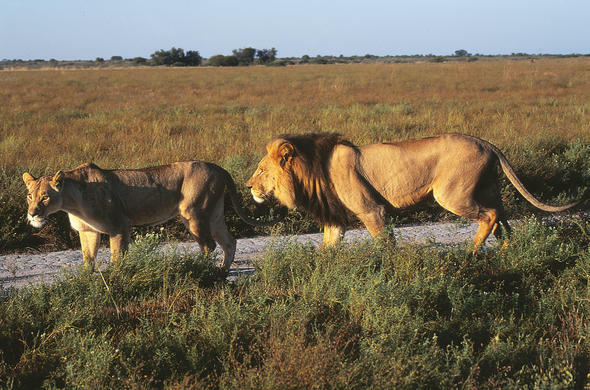 Kalahari Lions differ from their counterparts found in areas such as the Serengeti. They generally have a lower body weight and male lions tend to be between 20-40 kilograms lighter. This characteristic indicates that they have evolved to suit an extreme environment which demands longer travelling distances in to find prey Although these Lions prefer to hunt larger animals such Gemsbok and Springbok, they are often forced to make use of every available opportunity, and have been observed to hunt much smaller prey such as Porcupines, Aardvark, Foxes and even Mice. Kalahari Lions are also identified by the spots on their lower legs and the male Lions for their distinctive black manes. Well known as nocturnal hunters, Lions take advantage of the cooler temperatures to make their kills when they are able to expend the greatest effort. During the warm hours of the day, these large cats usually rest in shaded areas and keep cool by panting. Lions have adapted and go through patterns of panting in such a way as to cool down blood, which is then transferred to the brain. They are often found lying on their backs with their paws overturned. This is because they sweat through their paws, as well as the mucous membranes in their mouths. Similar to the way in which they have adapted to the scarcity of food, Kalahari Lions have attained the ability to go for up to 2 weeks without water. With their ability to tolerate extreme temperatures, these tenacious, resilient predators have braved living in this harsh environment and have found a way to survive in a hostile and seemingly uninhabitable environment.